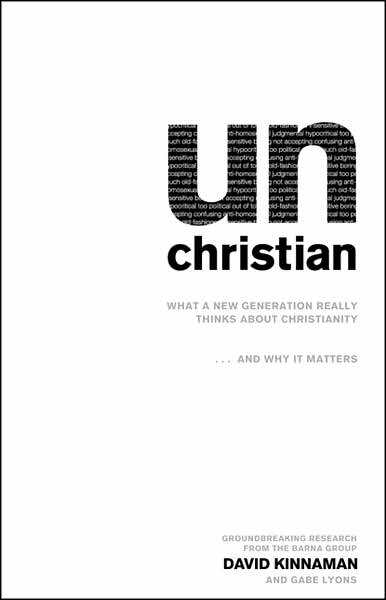 I recently read Unchristian: What a New Generation Really Thinks about Christianity … and Why It Matters by David Kinnaman, Gabe Lyons and Lloyd James. I was propelled to read it as I heard about a statistic at a workshop lead by Ron Martoia that 92% of 16-29 year old unchurched people see the church as judgmental and homophobic. I didn’t find myself agreeing with the authors about certain assumptions they seemed to make about Christianity or wholeheartedly agree with their solutions. 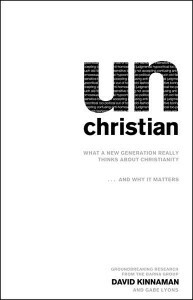 The book seemed to assume Christianity = evangelicalism, even while at times citing statistics that clearly showed the diversity of Christendom. Two things, in particular, I took exception to were how it defined a “Biblical worldview,” saying that those who have a “Biblical worldview” hold that: (1) Jesus Christ lived a sinless life, (2) God is the all-powerful, all-knowing creator that rules the universe, (3) salvation is a gift from God that cannot be earned, (4) Satan is real, (5) a Christian has the responsibility to share faith, (6) the Bible is accurate in all the principles it teaches, (7) unchanging moral truth exists, and (8) such moral truth is defined by the Bible. I would certainly not agree to all of these without qualification. And certainly only a portion, maybe a majority, but not necessarily, of Christians would agree to all 8 of these principles. A biblical worldview, according to the Barna researchers, was a gauge of a person’s faith. It wasn’t saying this is what evangelicals believe, it was saying this is what insiders to the church believe. In this and in several other occasions, I felt like authors were drawing the circle around Christianity a little too tight. Secondly was the book’s assumption about what Christians should believe about homosexuality. While the authors go to great length to say how we should not judge and should be kind to gays and lesbians and even seek out intentional relationships with them, they ultimately say that it is sin, falling short of God’s standards. They are quick of course, to qualify it, saying that we’re all sinners. In my experience, however, gay people perceive their “gayness” as part of their identity. Hate the sinner, love the sin doesn’t cut it on this one, because to call homosexuality a sin, is to say someone’s very identity is sinful, not in a theological ontology sort of way, but in an exclusive, personal way. However, I do accept the author’s solution as an improvement on the status quo. Essentially, what the authors seemed to be saying was that to solve Christianity’s image problem, we should be kinder, gentler, and less judgmental, but not examine anything about the things we actually believe. While being kinder, gentler, and less judgmental is a great first step and perhaps as much as I can hope for from evangelical Christianity at this moment in time, I think we’ve got deeper work to do on our own “orthodoxy.” As long as we call homosexuality a sin and until we make the standard of beliefs a little more Christocentric, I don’t think those in our “postmodern” culture who see the church as judgmental or irrelevant will take the church seriously.